Wiesbaden, 2018-Feb-21 — /Travel PR News/ — Norwegian Bliss, the third of Norwegian Cruise Line’s Breakaway Plus class, emerged from the Meyer Werft building dock in Papenburg, Germany on Saturday, February 17, representing a major milestone in the vessel’s construction. The ship will remain in the shipyard port for the final phase of construction, until its conveyance down the River Ems towards the North Sea, scheduled for mid-March. During this time, the first crewmembers will move into their staterooms on board, begin their training, and familiarize themselves with the ship – readying her for the first guests to arrive after delivery in 60 days, on April 19. The construction of the ship began in October 2016 with the traditional steel cutting ceremony launching the 12th Norwegian Cruise Line ship to be built at the Meyer Werft shipyard. It is the third ship in the Breakaway Plus class, measuring 1,082 feet in length by 136 feet wide, with gross tonnage of 167,800 and accommodating approximately 4,000 guests. 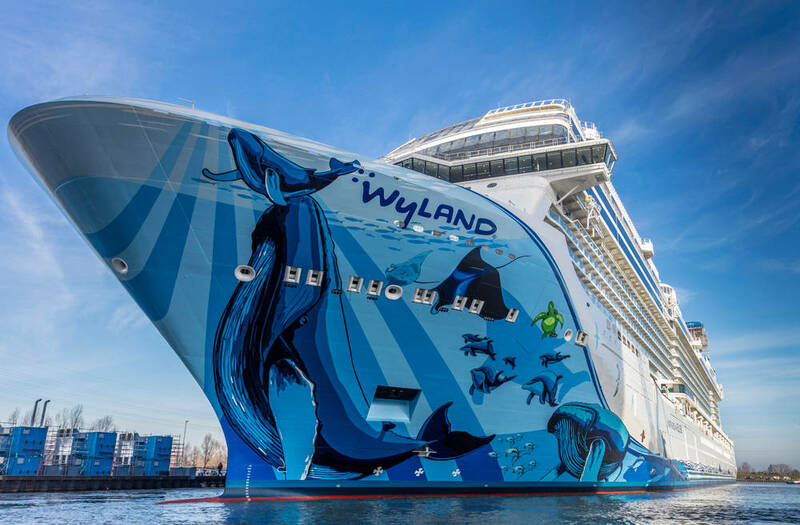 Part of the excitement of this float out will be the public debut of the ship’s signature hull artwork designed by world-renowned marine life artist and conservationist, Wyland. Best known for his marine life paintings, sculptures and grand scale murals, or “Whaling Walls,” Norwegian Bliss’ hull design is named “Cruising with the Whales” and features a stunning image of a mother humpback whale and her calf as the centerpiece of the design, representing the beauty of Alaska’s wildlife. Norwegian Bliss will be the first cruise ship custom-built with features and amenities for the ultimate Alaska cruise experience, including the 180-degree Observation Lounge where guests can enjoy Norwegian’s most expansive views at sea. She will also be the first Norwegian Cruise Line ship to make her debut in Seattle, with cruises beginning May 2018. Norwegian Bliss will offer weekly seven-day cruises to see America’s last frontier with ports-of-call including Ketchikan, Juneau and Skagway, Alaska, as well as Victoria, British Columbia, along with scenic glacier cruising. Following preview events in New York City, Miami and Los Angeles, Norwegian Bliss will sail into Seattle for her official christening on May 30, with summer cruises to Alaska beginning June 2. She will spend her summer seasons with seven-day cruises to Alaska, and fall seasons sailing to the Mexican Riviera from Los Angeles. In winter of 2018 she will sail to the Caribbean from Miami, and in the 2019 fall/winter season she will cruise from New York City to Florida, the Bahamas and Caribbean. Recently, the line was named “Europe’s Leading Cruise Line” for the tenth consecutive year, “World’s Leading Large Ship Cruise Line” for the sixth consecutive year, the “Caribbean’s Leading Cruise Line” for the fifth consecutive year, as well as “World’s Leading Cruise Line” and “North America’s Leading Cruise Line” both for the second straight year by the World Travel Awards. Norwegian’s next new build, the highly anticipated Norwegian Bliss, will be delivered in April 2018 featuring many firsts-at-sea for the global market including the largest race track at sea, award-winning Broadway entertainment, two observation lounges for guests to enjoy stunning ocean and glacier views and more. Norwegian will introduce Norwegian Encore in 2019, completing the Breakaway Plus Class series. Four additional Norwegian ships are on order for delivery beginning in 2022, with an option to introduce two more ships in 2026 and 2027. This entry was posted in Business, Cruises, Transportation, Travel, Travel Marketing, Travel Services, Travelers and tagged Christian Böll, Norwegian Bliss, Norwegian Cruise Line. Bookmark the permalink.